The Brooks Group provides business valuation services…through its NACVA accredited Certified Valuation Analysts…across a broad spectrum of industries. In defining the scope of valuation services needed by a particular client, we work with the client’s ownership/ management team to determine the reason that is generating the need for a valuation (such as for estate/gift tax planning purposes, as part of a succession plan, or because of a contemplated “M&A” business transaction). 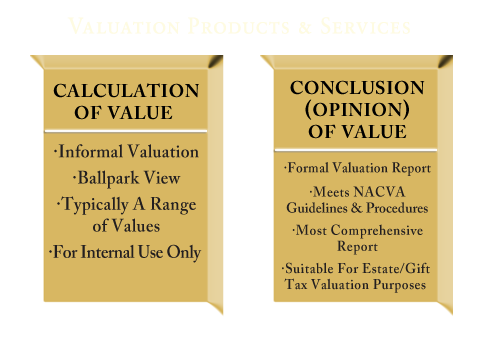 Once the reason for the valuation has been determined, we work with our clients to determine what type of valuation service best fits their targeted needs—typically this determination revolves around whether the valuation service will focus upon providing a Calculation of Value (which may be applicable when the targeted audience is internal to the client) or a Conclusion/Opinion of Value (which may be applicable when the targeted audience is external to the client). Whatever the valuation needs may be for a particular client, The Brooks Group is positioned to work with the client to meet those valuation needs in accordance with NACVA guidelines and standards.